Pinnies (optional – to distinguish teams). 4 items to pass (baton, rubber chicken, dodgeball…etc.). 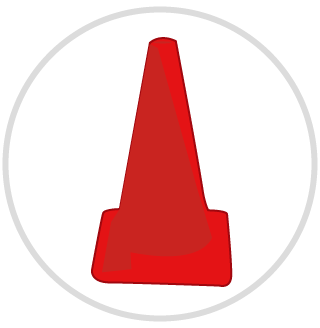 Build a rectangle using the 8 cones as shown on the next page (the rectangle should be approximately as big as a full length volleyball court). Split the kids into two even teams, and then make four lines of kids (so that each team has now been split into two lines (each right across from the other – as shown on the next page)). The first person in each line holds onto the item that they will be passing (like in a relay race). The object of the game is to catch the person in front of you by tagging them. 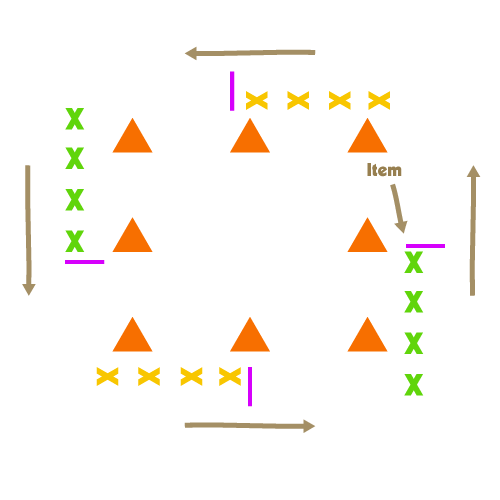 Each person must run completely around the rectangle once, before handing their item to the next person waiting in their line, who then takes off after the person right in front of them. If a person cuts into the rectangle, the teacher will blow the whistle and award a point to the opposing team. The minute a person is tagged, the game stops and the tagger’s team gets a point. Play to 5 points, and then either switch the teams or play again. Remind kids that when they pass the item to the next person in their line they need to step INTO the rectangle, and immediately go to the end of their line, in order to avoid other runners on the track.